A husband is a key pillar in the life of any married woman. He provides both physical and emotional support to the wife and family in general. Getting someone who gives their all for you like a husband does is very hard. A husband will do his best to ensure the wife and kids live a better life. He will take you out just to prove how much he loves you. Finding someone who compliments your beauty every day like he does can be an enduring venture. Someone who has dedicated spending the rest of their lives with you mean good for you. You should always appreciate your husband and make him feel loved. It is a norm for most marriage unions to celebrate their anniversary each year to mark the special day when both couples exchanged vows. Anniversary celebrations will give you time to look back on your special day, and the moments you shared together. It also gives couples an opportunity to reminisce the years they have been together. You do get time to assess your union and point out the areas where you are not doing it right. Evaluating your union gives you the opportunity to set goals which you should work on as a couple. This moment always gives you the chance to celebrate another year as a married couple. It is the right moment to gift your husband or write a sweet message to make him feel special. Finding the right message for a husband is always a difficult task for most women who may be confused on what to pen down for their spouses. You should take time and get it from the bottom of your heart. There is also no need to worry because we can help you get the most romantic wishes for your husband’s anniversary. Happy Anniversary to the sweetest and most caring husband. Life has given us another year to be with each other and create everlasting memories. Happy Anniversary! On this special day, I want to thank you for always being there for me even through the most desperate moments. You are the best thing to ever happen in my life, and I pray for many more years of our union. Happy Anniversary! Happiest Anniversary! The love of my life. Thank you very much for treating me like a queen even through the darkest days. You’ve always given your all for us. Lots of love from me honey. The joy, the tears, the laughter and happiness you have shown to me throughout the years cannot be described. Am happy to say I found the love of a lifetime. Happy Anniversary my husband. I have never doubted your love for me even for a single day.You are the only person I want in my life forever. I hope and pray that our union will last forever. I love you to the moon and back. Happy Anniversary! You have shown me what real love is throughout the years without considering my imperfections. You have shown great dedication towards the kids and me.I am now a strong and successful woman all because of you. I appreciate your love very much. 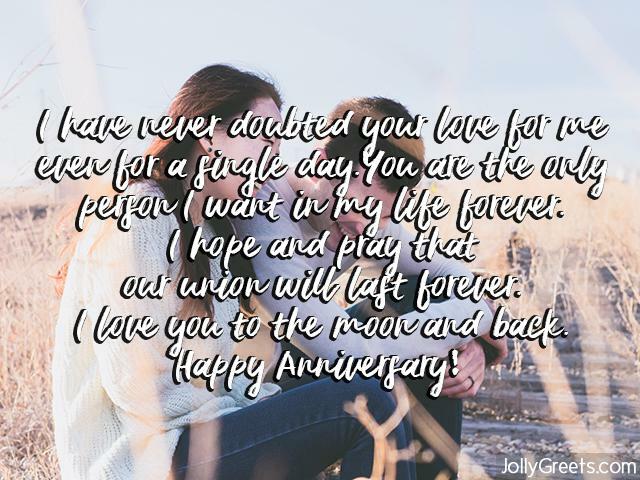 Happiest Anniversary dear husband! When we first met, you promised to love and always be there for me. Now I know you don’t mince your words because of the love you have shown me throughout the years. I promise to stand by your side and be with you forever. 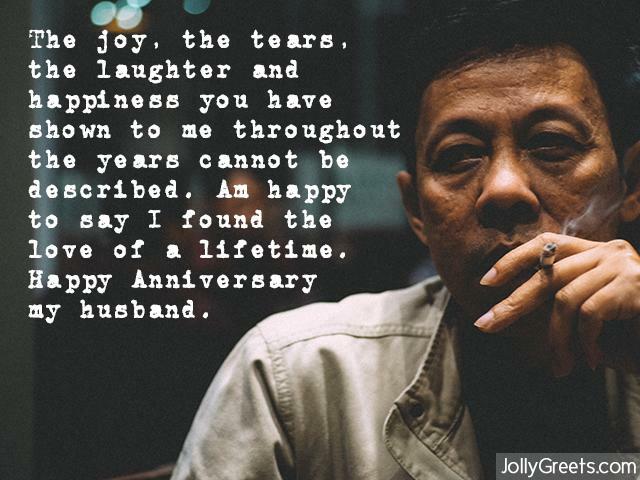 Happy Anniversary my caring husband! There is nothing more I can ask for because I have you by my side. Your love to me has been undying and limitless. You’ve never shown me your back when I need you most. I thank God for blessing me with the best husband. Happy Anniversary to you my love. You have brought joy and constant happiness in my life. You are the reason behind the growth and unity in our family. Let me appreciate you for being a great husband all through the years and a wonderful father to the kids. Happy wedding Anniversary sugarpie! It was just the other day when we exchanged vows, and you promised to be my guardian angel forever. One year down the line, you are still the same romantic and caring guy. I love you so much. Happy Anniversary dear love. You are the best thing to happen in my life over the past year. I always thank God for bringing you into my life. I will never stop loving you. Happy Anniversary my love. I always call myself lucky because I not only have a husband but a dime. One year with you has been like 40 days in paradise. I’ve always had a smile on my face and am forever grateful for that. Thank you for loving and taking care of me. I love you so much. Happy Anniversary. Ever since your love came my way, I’ve been having good times every day. You’ve loved me and taught me to live life positively. Thank you for being my lover and best friend. Happy Anniversary. Nothing can beat the joy of having you as the person to spend the rest of my life with. I knew it was you the moment I met you. You have proved that by staying true to the kids and me. Your endless love over the years has always given me a reason to be happy. I love you, dear. Happy Anniversary! The fun moments we share together, the number of times you keep telling me am beautiful and supporting me throughout the years are just but a few reasons that prove you are the right person for me. I will forever cherish our love. Happy Anniversary Sweetheart. How I wish we would be celebrating throughout just to write a million messages to express the love I have for you. Having you as a husband is one of the best things to happen in my life. Our union keeps getting better each day and year. I will forever love you, my husband. Happy Anniversary!